An Taoiseach Enda Kenny, pictured with the European Tour’s James Finnigan on Sunday, is committed to supporting the Irish Open. Picture: Fran Caffrey / www.golffile.ieThe Irish Open might not be clinging on for dear life for survival but it needs a title sponsor as soon as possible according to one of the leaders of the Irish golf industry. Denis Kane, Chairman of the Ireland Golf Tour Operator Association and one of the leading figures in the recently created Golf Club Business Association of Ireland, believes it’s crucial that the air of uncertainty surrounding The Irish Open is dispelled. “The Irish Open is a hugely important shop window for Irish golf all around the world,” said Mr Kane, who was a leading light in the running of the 2002 Seve Trophy and four Irish Opens at Druids Glen. “We are in a very competitive market place and the importance of having our name out there when new markets are emerging to compete with us for business are emerging every year,” he said. The European Tour wants a sponsor but believes it can get by using the current multi-sponsor model, government investment and gate receipts. “The Irish Open certainly needs a title sponsor, not just from the point of view of making the event profitable but also from a marketing perspective,” Mr Kane said. “We are back now in a situation of uncertainty again, speculating as to where it will be held next year. Ideally you would like to sign off saying, thank you very much, see you next year at Carton House or wherever. 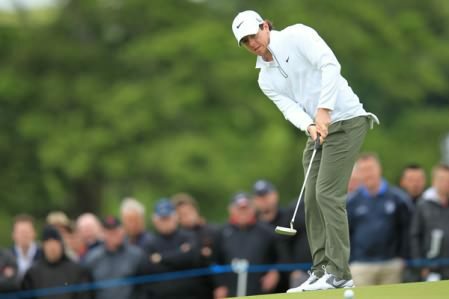 The European Tour is keeping its fingers crossed that it managed to break even at Carton House last week following the obvious hit the event took when major winners Rory McIlroy, Pádraig Harrington, Graeme McDowell and Darren Clarke, and Ryder Cup captain Paul McGinley missed the halfway cut. 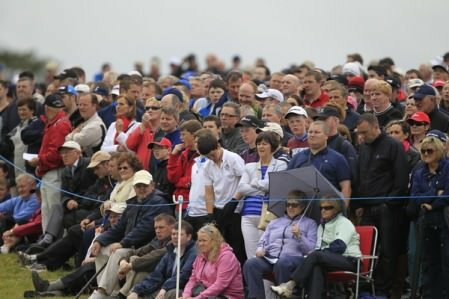 However, the European Tour’s James Finnigan, Commercial Director for the Irish Open, insisted that the event does not necessarily need a title sponsor to survive and declared the tournament a success story. “Everyone seems to think that this is a struggling event,” Mr Finnigan said yesterday. “In fact, it is a very successful championship. “I need to get the figures from our accountants but I know that at the weekend, losing the four lads plus Paul McGinley cost us money. I am not sure how the numbers break down yet but I am hoping we will be close to breaking even. Overall it was great week. “My mind goes back to the first tee on Friday afternoon at 10 to one when Rory was teeing off. The crowd sccene there was like an Open Championship, it was remarkable. Then you look at the number of people who came in to support the event on Sunday (24,000). The Mallaghan family, owners of Carton House, are keen to host the event again and while the European Tour is believed to be committed to returning to Royal Portrush in 2015, a decision on next year’s venue has yet to be made. The European Tour was pleased with the overall attendance of 81,379 for the four tournament days but will wait for formal feedback from its sponsors and leading players before making a decision on 2014. The €1.25 m investment from Fáilte Ireland appears secure given the presence of An Taoiseach Enda Kenny at Carton House on Sunday. While last year’s event in Portrush generated a profit of just under £1m, Mr Finnigan suggested that the event does not necessarily need a title sponsor, providing he succeeds in increasing the level of investment by a portfolio of 18 official sponsors. “In an ideal world it would be great to have an official sponsor because then you would only have to work with one or two clients,” Mr Finnigan said. “But the Irish Open doesn’t have to have a title sponsor. 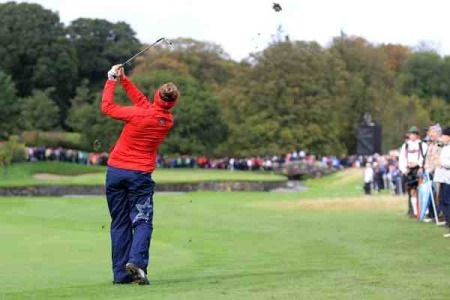 Shane Lowry gives the crowd something to cheer about in the final round at Carton House. Picture: Thos Caffrey / www.golffile.ie“I just need to try and increase the interest from some of the official sponsors programme. The Irish Open almost has more affinity without a title sponsor. If you bring X, Y or Z in the players might think there is less of an affinity with the event. Home hero Shane Lowry holds the key to the O’Meara Course at Carton House beating off serious competition to host next year’s Irish Open. The two-time European Tour winner, who has a home overlooking the spectacularly beautiful sister track to the tough Montgomerie Course, will tee it up with Mr Finnigan later this summer. That could be enough to persuade the Tour to take the event to the more compact and tree-lined O’Meara layout and scupper offers from rival resorts around the country. “Let’s just say Carton House haven’t done themselves any harm with the way they hosted the event,” said Mr Finnigan. “I intend to play the O’Meara Course, maybe with Shane Lowry at some point in the near future and get his feedback on it. “We can see how we could frame it very nicely because there is a wonderful loop of holes there from the 14th to the 16th with wonderful waterfall backdrop. It would be magnificent to play golf through the trees. According to one source familiar with the bidding process for the 2014 Irish Open, “the usual suspects” have expressed an interest in wresting the tournament away from Carton House. They include Druids Glen, which has yet to make a formal tender, as well as Mount Juliet, Fota Island, The K Club and Lough Erne. Having been heavily involved in the staging of four Irish Opens at Druids Glen from 1996 to 1999, Mr Kane is aware of the benefit the event has for a host venue. Is Killeen Castle about to stage a late bid to host the 2012 Irish Open? Picture by Jenny Matthews www.golffile.ieEuropean Tour chiefs are remaining tight-lipped on the venue for 2012 Irish Open.